Jesus tells us the Kingdom is like a hidden treasure or a valuable pearl. He challenges us to go all in -- the cost is high -- because the payoff is immensely high. God's dream for us is one of joy: joy in our hearts, in the world around us, and at the end of our lives. As Christians, we usually downplay both the cost of discipleship and the reward. The cost of discipleship, if we take it seriously, is a hard sell. Give away my money and power, live my life serving others, and take up a cross to follow someone to his death? No thanks! So we are inclined to downplay the challenge and soften Jesus' edges. Pope Francis' apostolic exhortation The Joy of the Gospel appeals for us to recognize how great the Kingdom payoff is, and for us to respond. If we're not joyful about our faith, we're doing it wrong! 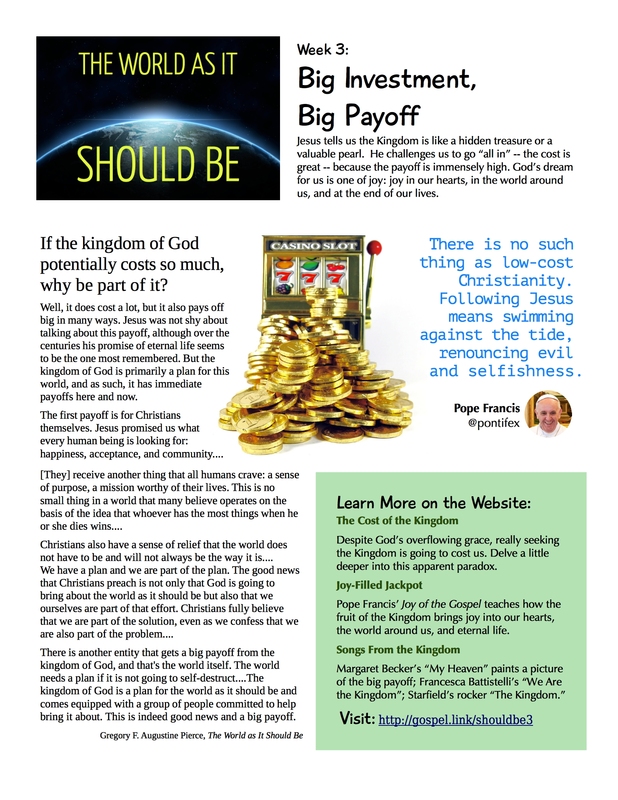 The "big payoff" of the Kingdom comes in three ways: within our hearts (as we are converted and let Christ rule), in the world (as the Kingdom transforms it, with our help), and at the end of our lives (at Christ's return and in heaven). It can be difficult to believe that the cost of discipleship is "Good News," especially in a culture so inclined toward fulfilling our every desire ("indulge yourself," we constantly hear). A popular approach to spirituality today is to look inside for a divine experience and personal fulfillment, guided by what feels right. While we believe Christ is present within us, we need to remember that we are not God and discipleship will not always feel good. Fulfillment and an inner joy comes from accepting God's grace and following Christ, and the Kingdom is always beyond ourselves. Why would someone join our faith -- or start intentionally living it -- if we don't seem joyful? How good are we at authentically expressing the joy we find in our faith? The images of buried treasure and the pearl of great price both emphasize the Kingdom as hidden, extremely valuable, and worth everything we have. The image of a net thrown into the sea reminds us of the ultimate range of the Kingdom, the urgency of moving into Gospel living, and how we are not the ones called to judge others. View the week 3 public page for more ideas.